Private Training lessons can be arranged at a time to suit you, either at your own home, out and about in your local area or at our field in Spellbrook. Group lessons are not for everybody and some dogs benefit from individual attention, particularly if your dog is fearful of other dogs, new situations or people. As we do not accept reactive dogs into a class one to one training can help resolve their issues so that you can then feel comfortable joining a group, if that is your aim. Private lessons can also help you to become a more confident dog handler as each lesson can be planned specifically for areas you wish to address and you can progress at your own speed. There are also some problems that are best addressed in the home environment, from helping your dog to get along with your cat to resolving separation anxiety. Get a head start before you join a class - puppies especially benefit from early training and proper socialisation at home before their vaccinations are completed. Please contact us via the form below for details of our Puppy Pack which includes a discounted private lesson at your home as well as the full puppy course. We can also help you with advice even before you bring your new dog home, whether a puppy or an older rescue dog. Private lessons at your home cost £60 an hour, or £40 an hour if the lesson takes place at our Spellbrook training ground. If you have any questions at all about our private training and what it entails, or would like to book a lesson, simply fill in the form below or call Adrienne on 07881 552559. 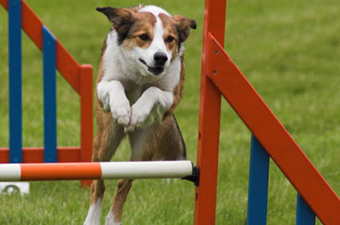 Private Training Classes are a great way to have fun with your dog whilst developing a great working bond between you. Book a Private Training Class in Hertfordshire.